The Shot: Is David Blaine cheating? 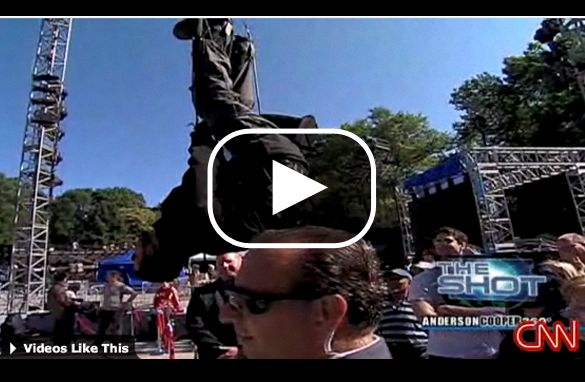 We keep David Blaine honest on his most recent stunt...is he cheating? No matter what anyone says I think that to even attempt what he is doing is amazing and takes a lot of guts. Even for an hour is dangerous. More power to him. Way to go David!!!!!! David Blaine is an "illusionist" and not a very good one. Don't buy his weak hype...I'd rather watch competitive eating, making hot dogs disappear is a better skill than playing "batman". Maybe hanging upside down is helping to get the loose screw in his head back in place. What kind of a nut would think to himself, "I think I'll hang upside down for sixty hours and see if anyone will watch". Sometimes people need an escape, David is doing nothing but entertaining and no doubt pushing the limits of human endurance. NOBODY else would have the drive and will to do this for three minutes let alone as long as he has and not to mention all the other things he is enduring. I have all the respect in the world for him. And this 'cheating' crap is ridiculous please do research before you attempt to discredit him. He said in many press conferences that he will have to do excersises with his legs, do sit ups trying to keep his head above his heart and have brief checkups with medical examiners, it is a must., he needs his catheter changed, he can not drink upside down as all the pressure in his throat makes him vomit back up, woudl you rather him pee all over everybody standing below him and puking, this type of stuff has not even been examined before, the fact that he has checkups does not mean that he is cheating, nor does it take away any danger. It is still dangerous. Im offended that this was posted just start drama. He's not cheating. John McCain will vouch for him Anderson. He never lies right? I am a fan of David Blaine. He has done a few pretty interesting things. In my opinion, based on the way they pitched it before hand...he is cheating. Who really cares anyway. David Blaine is a blight on Magic. Of course he is not going to hang upside down of even 24 hours. You do know when he was buried in ice thye fogged up this ice and some else took his place so he could rest, eat, pee and sleep. It is all illusion, some better than others. He should stick to close up (if he can). There is something wrong with Blaine. I really dont know what he really is. Is he a magician? Is he a exhabitionist? He seems to play by his own set of rules. He is not a magician, no magic. He think he loves the publicity. As far as Im concerned when you say you are going to hang upside down for 60 hours and you make sure every news organization on earth knows so they will tell everyone and they show up to interview you,you better be upside down for 60 hours. Of course he is cheating. But he does these stunts for the attention. I dont think much of him or care much of him. I just can't seem to digest the fact that economy is in trouble, presidential elections are in heat with issues on the table, People are struggling to keep their home or jobs and news papers and websites are talking about this punk or Lohans or Clay? Perhaps he needs a break or two to restore the blood flow to his body. You would think with all that blood rushing into your brain it would jolt it into the realization that this stunt is probably a bad idea. Oh Well..